Acer Aspire D255E configured with Win7. WiFi trumps Ethernet connection when both are engaged. In order to use the wired LAN connection, the WiFi must be disabled. When this laptop is running Ubuntu, LAN trumps WiFi as expected: therefore not a hardware issue. How is WiFi configured to be secondary to Ethernet? 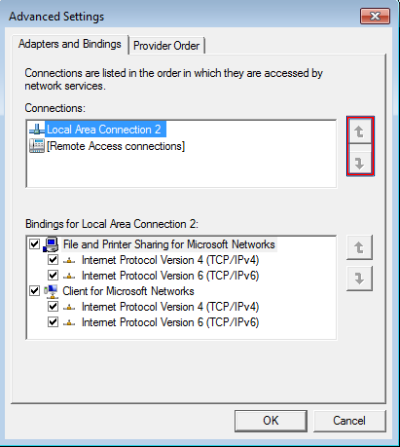 In the Advanced Settings window you'll see a list of Connections along with arrow keys to the right that allows you to modify the preference order of your available connections. Move your wireless adapter to the top of the list. Not the answer you're looking for? Browse other questions tagged windows-7 networking ethernet or ask your own question. How to achieve reliable Gigabit Ethernet Link with my Acer Aspire Revo R3610? Can I setup one router (modem) for ethernet internet only and another router for Wifi only on the same network?